MOSCOW, July 23. /TASS/. The international airshow MAKS-2017 has yielded contracts and agreements to a total sum of 400 billion rubles (6.74 billion U.S. dollars), the Russian ministry of industry and trade said on Sunday. "MAKS-2017 has yielded big opportunities for aircraft manufacturers, with contracts and agreements for supplies of Russian-made aircraft standing about 400 billion rubles. It is important that MAKS is becoming a business platform and participation in it is not just a matter of prestige but an efficient instrument for establishing partner relations. Over three days, MatchMaking talks were held mostly with small-and medium-sized companies," Minister Denis Manturov said. Among MAKS’ biggest deals were a contract for the supplies of 20 Sukhoi Superjet 100 planes to Aeroflot - Russian Airlines and a contract on operational lease of 16 MC-21 planes, including four airlines with domestically manufactured PD-14 engines, with the Red Wings air carrier. In all, about 180 foreign manufacturers from 35 world nations took part in the airshow. More than 1,000 companies conducted more than 1,500 talks. 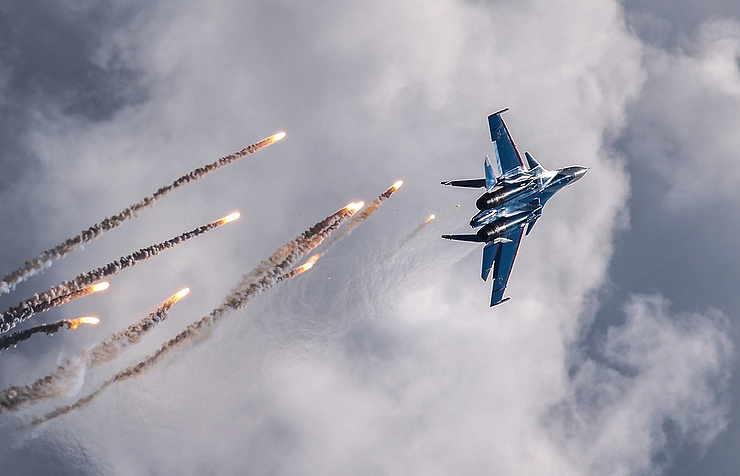 A number of new developments, including a generation 4++ MiG-35 fighter jet and a Mi-171Sh-VN helicopter for special operations, were presented at the airshow. The international airshow MAKS-2017 was held in Zhukovsky outside Moscow from July 18 through 23 and was visited by more than 452,000 people.